I'm not sure if I've mentioned it before, but I love to find easy ways to do everything. I love life hacks. A blog post that offers easy solutions to problems will grab my attention instantly, and I've subscribed to countless 'easy home maintenance solutions', 'simple storage solutions' and 'easy planning tools' blogs, to name just a few. So when I needed to create a special clip, following our recent Friend Sunday to recap and highlight the event, I knew an easy way to do it. And you can do it, too. But before I go any further, perhaps I should show you some of the clip I created. Of course, I'm always careful that any clip I produce for public viewing does not include images of the kids unless parents have signed a release form. But plenty of other photos can be taken and included in these types of clips, though: activity tables, snacks or food, table decorations, the hands of kids holding or doing something, feet during an activity and so forth... see example. So... take a quick look at this simple clip to see the potential of Smilebox, the program I use to create so much of my graphics and media:clips, slideshows, invitations and powerpoint slides. It really requires little more than some photos of your program or event and the addition of some optional captions. The rest, (background design, music) is provided. First, you'll need to download the Smilebox program. Create a Free Slideshow. Choose from our selection of basic designs. Add Photos, Videos & Music. Create and share in minutes! Choose a design, add your photos and music.. the slideshow maker does the rest. Email, post to Facebook, burn to dvd or save the file... easy. What can you use these videos for? 1. A event review for the church family. 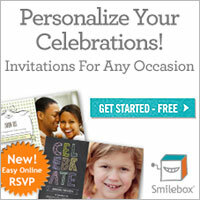 The sample included was created for our church family following a special event. This type of presentation is very popular. It doesn't take a huge amount of time to show during the service and it can also be posted on your church Facebook page. 2. An engaging promotional clip. This type of presentation works just as well to promote an upcoming event or program. You can include graphics from your program as well as photos to highlight the event/program. 3. Introduction to your weekly kidmin program. Kids love to see themselves up onscreen. Try taking photos of your Sunday activities- kids singing, games, snacks or crafts. Load them into your Smilebox presentation and show the clip the following week as a 'What happened last week' introduction to your program. Our kids enjoy it so much, they'll come up during our program to ask if I'll take a photo of their craft, or ask if I managed to get a photo of their team winning the point. 4. Create a introduction to the main Bible lesson. Take photos of items or situations that relate to your story eg. sand, buildings, Bible, storms, water, people walking. Add some cryptic clues or the Bible verse or Bible point. 5. Use to tell the Bible lesson. Organise kids the week before to act out scenes that you can photograph and use to create the story for the following week. It might be a great activity that a teenage volunteer could do with kids who arrive early or use this as one of your activity rotations. Check out the short demo below to see how easy it is to create a video clip for your kidmin. This is my first attempt at one of these types of instructional clips, obviously. I hope I'll relax a little and do a better job of the next one. It really is easy to use and I'm sure you can create some wonderful presentations. Have fun! Disclosure: Some links in this email are affiliate links meaning, at no additional cost to you, I may get a commission if you make a purchase. Thanks for your support in this way!